The Change of Command from LTC Spivey to Colonel(R) Stanley C. “Staś” Preczewski, USA, Ph.D. 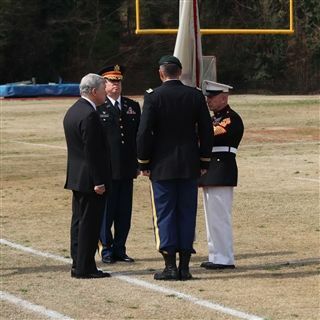 The Presidential Change of Command for Riverside Military Academy was during Spring Parents' Day on March 29, 2019. This was a once-in-a-lifetime event that was held at Maginnis Field, on campus. The ceremony is a special tradition, symbolically demonstrating the change of command from RMA's Interim President LTC Spivey to RMA's new President Colonel(R) Stanley C. “Staś” Preczewski, USA, Ph.D. In the military, a change of command is a military tradition that represents a formal transfer of authority and responsibility for a unit from one commanding officer to another. The passing of colors, standards, or ensigns from an outgoing commander to an incoming one ensures that the unit and its soldiers are never without official leadership, a continuation of trust, and also signifies an allegiance of soldiers to their unit's commander; a value RMA has instilled for 112 years. Alumni, parents, and friends of the community were invited to attend the special event.